This site is hosted by The Pit. They bugged me until I finally broke and gave 'em my site. Actually, I'm not even typing this; Calis is. Nanny nanny boo boo. PlaneScape: Torment is computer game. It's not bad. It's being made by the cool guys and gals at Black Isle Studios. Another company called Interplay is giving them tons and tons of money to make it, but Black Island would make it anyway. They're the kind of fruitcakes that would live in a cardboard box if it meant they got to work on games all day. It goes without saying that all these people live in California. Who am I? I'm Becker. I have no life and play these addictive games until 4am. What's new? Click here for The Deal! What do you think of my entry for the Torment webring image gif? It took me a really long time to make. IGN didn't seem to care for it too much though. I wonder why? 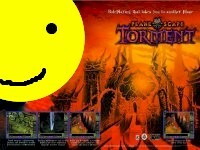 This Planescape: Torment Webring is owned by The Pit. Um, this is like, satire. It isn't real. I stole that big image up there, but I think I'm allowed. The image with the Nameless One as "smily" I totally doctored without permission. I also used the BIS logo without permission. I'm a bad person. I'm also a bad person without any money, so suing me isn't going to do anyone nearly as much good as just telling me to knock it off. That "slacker" gif is all mine though. Go me. All rights reveresed. All rights wronged. If it isn't copyright Derek Becker and/or The Pit, it sure as hell is copyrigted by Interplay. I buried Paul.